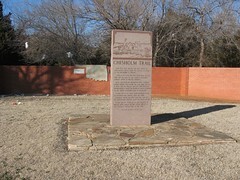 Chisholm Trail Marker erected on Land of John E. Kirkpatrick given to him by his grandmother, Mrs. Lewis Mortimer Spencer, on date of his birth, Feb. 13, 1908. His grandfather , Lewis M. Spencer, was one of Yukon Founders. I-40 take exit Garth Brook north pass Wal-mart Supercenter to W Vandment on the north side of street. Over this spot passed the vast herds of longhorned cattle from the ranges of Texas to the railroads in Kansas. It was in 1867 that the first herd came up this trail on the way to the nearest railroad loading yards in Abilene, Kansas. Jesse Chisholm, an Oklahoma part - Cherokee Indian trader, soon after the Civil War, laid out a trail for his freight wagons that reached approximately from the Arkansas River in Kansas to the north Canadian River in Oklahoma. In time the entire Trail from southern Texas to northeastern Kansas took the name "Chisholm" after the man who had laid out the major part existing when the drives began. In the twenty years of its use millions of beeves were driven up this route, making it the greatest cattle trail of all time.